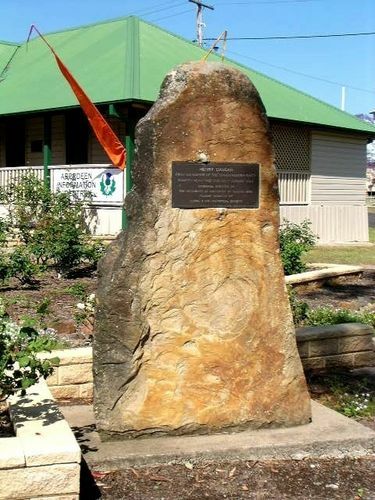 A monument marks Henry Dangar’s Camp Site. Dangar who was a surveyor and pastoralist was appointed assistant in the Survey Department and employed in the counties of Camden and Argyle. He transferred to Newcastle to make a detailed survey of the Hunter Valley and for the next two years measured and marked out in the Hunter River and as far north as Patrick`s Plains. He also marked the road from Newcastle to Wallis Plains (Maitland). First explorer of the Upper Hunter River camped near this site on 1st August 1824. Memorial erected by the residents of Aberdeen 3rd August 1974. Plaque donated by Scone & U. H. Historical Society.